PALM READING - Life Line: Line of life in Palm Reading & Palmistry! 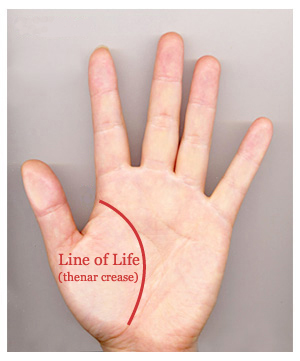 Life Line Palm Reading: Line of Life! 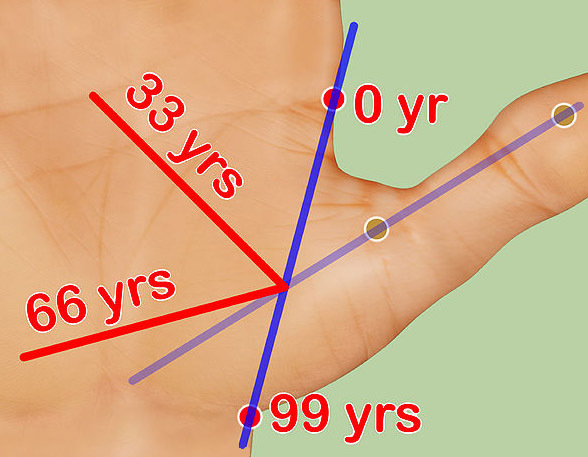 The classic association between the length of the life line and longevity finds it's origins in Hindu palmistry: the Indians call the line of life the pithru or gotha rekha. However, scientific studies have indicated that the link between the lenght of the line of life and longivity is rather weak. In 1974 American researchers (M.E. Wilson & L.E. 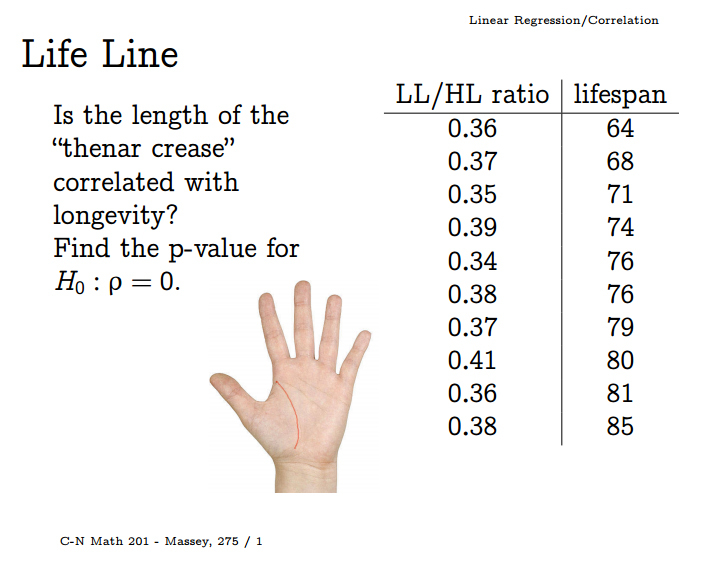 Mather) presented a study which reports: "lack of correlation between length of life line and age of death"; however, in 1990 British researchers presented a study which reports regarding the length of the life line: "a strong statistical correlation, particularly for the right hand, and age at death". Now, what is the scientific truth behind these finds? First of all, it is important to notice that many palm readers & hand analysts today make statements which debunk the classic theory which suggests that longevity can be read from the length of the life line. And even in the palmistry literature reports have been made regarding the fact that many people who die young often happen to have a long life line, and short life lines have been noticed among those who died at high age. "Structure is the intimate expression of function"
Palm reading life line & longevity data report (unknown source). Palm Reading the 6 major lines. The book 'Anthroplogy of Crease Morphogenesis' (R.S. Bali, 1994) describes how the palmar lines & palmisty have been perceived to represent synonymous relationship and how the stigma of fortune-telling has debarred the hand lines from scientific courts. 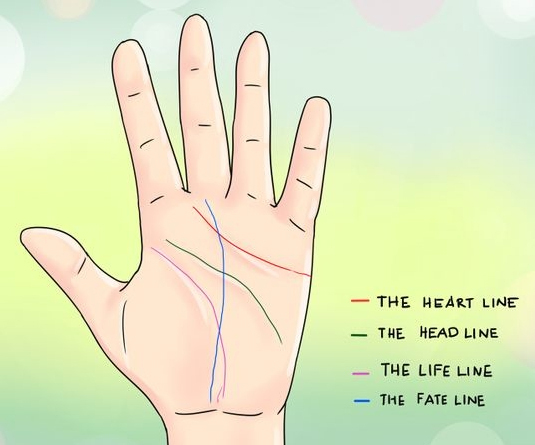 In the fields of palm reading & palmistry six lines are recognized to represent the major palmar lines (or palm creases), and the life line represents one of them. However, in the scientific perspective only the first four are recognized to represent 'primary creases' because of their embryonic nature + their pre-ordained shape and position. Palm reading/palmistry: analysing your marriage line. Much has been written about the life line; however, even the start- and end points have been disputed. 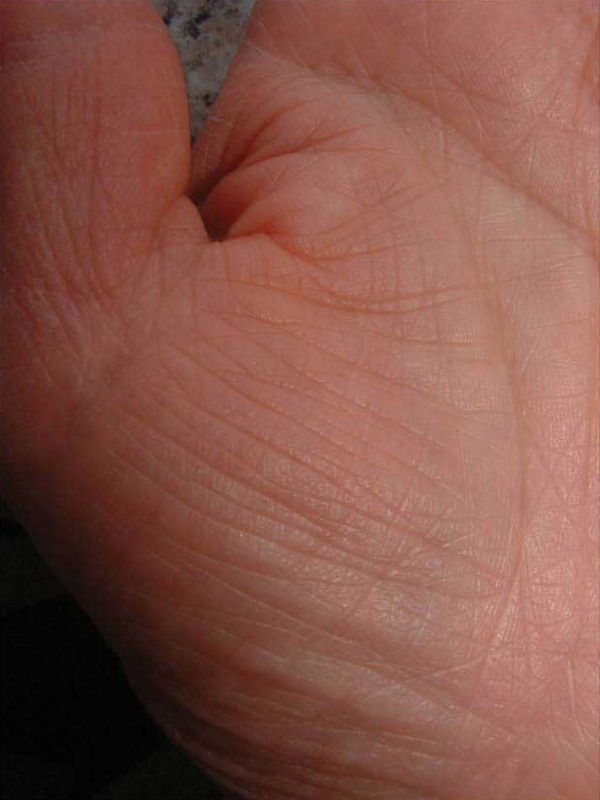 Generally, the starting point of the life line is perceived to be found at it's radial termination (between the thumb and the index finger). This is also confirmed by embryologic studies which have pointed out that the life line (= thenar crease) starts developing in the 7th week of pregnancy above the upper thenar; later the line usually progresses into the palm curving around the mount of venus (= thenar eminence). 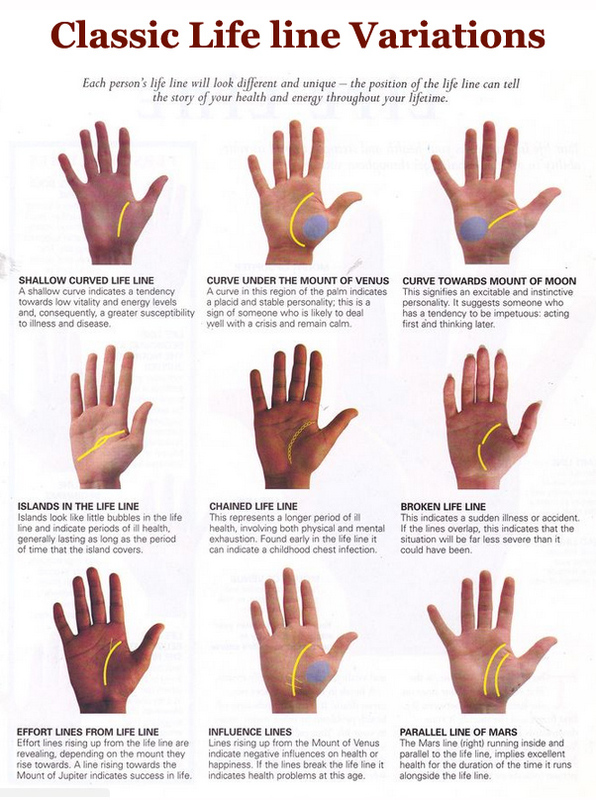 The picture below describes some classic life line variations taken from the palm reading & palmistry literature. Palm reading marriage line: 9 variations! 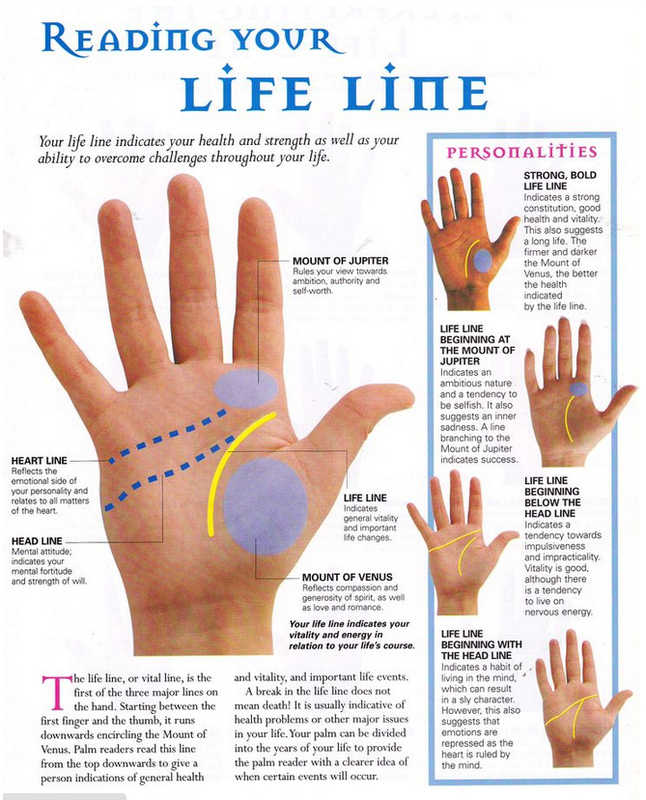 While processing the info presented above, please be aware that many concepts & theories for the 'life line' have been proposed inside the palm reading & palmistry literature. Unfortunately few of these concepts have been widely adopted, and far most of them have never been tested independently! According Multi-Perspective Palm Reading it is likely unrealistic to expect that a reliable assessment for anything at all can be made with just a single feature of the hand: other perspectives of the hand really need to get involved as well! Discover Palm Reading & Palmistry! 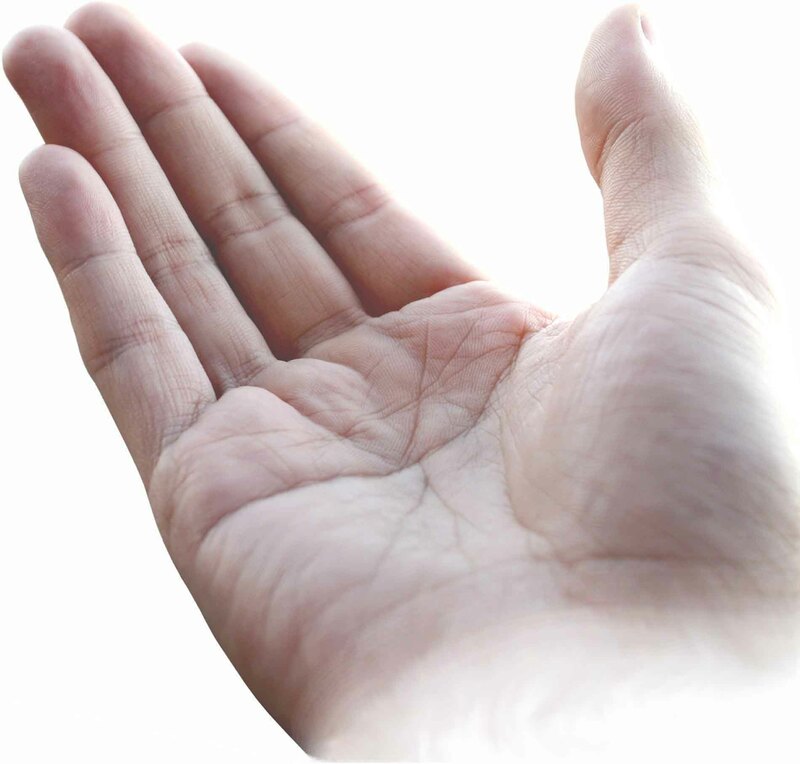 What are the major lines in Palm Reading & Palmistry? Explore the major principle in Palm Reading & Palmistry! 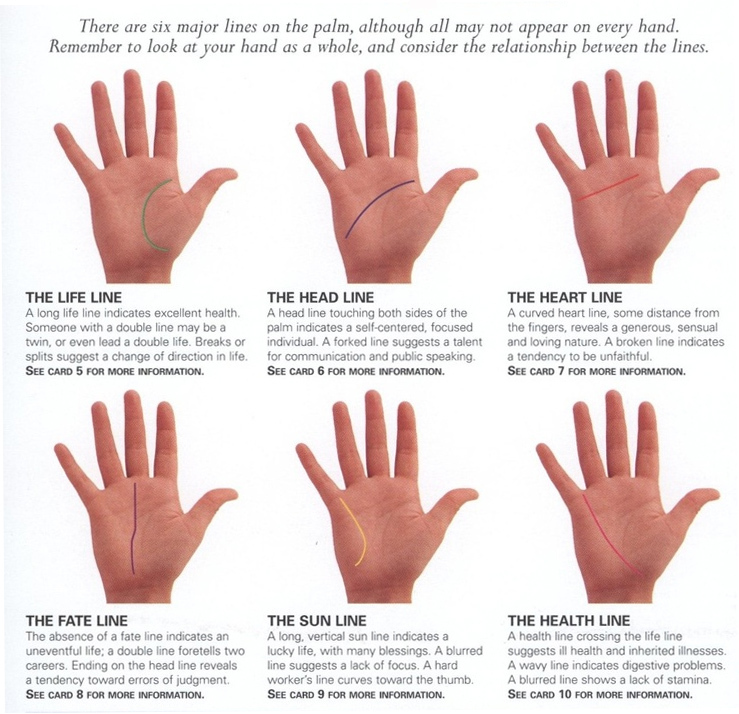 The life line plays a major role in Palm Reading! The scientific truth about relationship lines & love lines!